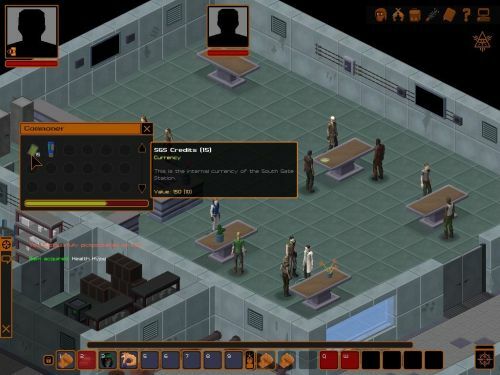 Styg has posted another development update for his isometric turn-based RPG Underrail, which all of you should support on Steam Greenlight. You can also preorder Underrail on Desura or on GamersGate and gain immediate access to the latest alpha version of the game. First of all I revamped the pickpocketing mechanics as I promised. The way it works now is that when you are stealing items from an NPC you are filling up their permanent "suspicion meter". If you fill up this meter to the max you will be detected and the combat will ensue. The game will indicate how much stealing a certain item will raise the suspicion meter. The rate at which you fill this meter will depend on the ratio between your pickpocketing skill and the victim's detection. Since the detection scales off of character's level and perception, this basically means that you'll have to continue investing points in the pickpocketing skill (and ideally dexterity as well) in order to be able to steal (or steal more) from progressively higher level NPCs. Also, some items are harder to steal than others (e.g. heavy weapons and armors in comparison to smaller stuff like ammo and hypos). The way this system is set up it means that, unlike lockpicking and hacking, the outcome is not binary. Depending on your skill-to-detection ration and the difficulty modifier of the item, you may be able to steal zero, one or more items from a given target. So investing more skill into pickpocketing will always be useful. Because there's no dice involved in the calculations, this will also eliminate the need for save scumming. Read the update in full for the changes Styg has introduced to feats.